Making kimchi is my own weird personal holiday tradition. I tried giving it out as holiday gifts a few years back, which was not the best idea. I have a few select people in my life who are very appreciative of homemade kimchi, but most folks seem to prefer cookies. So I quit it with the kimchi gifting, but not before the kimchi holiday tradition became ingrained in my brain. It just doesn’t feel like Christmas if I’m not elbow deep in a bowl of napa cabbage and chili flakes. Fortunately, I love kimchi and my husband and I are fine to devour a big batch over the course of January. Also fortunately, there are lots of warming wintry dishes I can put my homemade kimchi in, like bibimbap, kimchi fried rice, and this kimchi stew! Kimchi stew is actually my favorite when it’s really cold outside. It’s flavorful and spicy, and if you serve it piping hot it’s sure to warm you up. Start by pan-frying some tofu in a bit of oil. Check out my guide here for tips on how to get your tofu perfectly crispy. Once the tofu has browned, take it out of the pot, add some oil, and cook an onion just until softened up. Next, add some garlic, and then the kimchi. Cook the kimchi for a minute or two, then add some broth and shiitake mushrooms. Optionally, you can also add some gochujang, which is a spicy fermented Korean red pepper paste. It’ll give your stew an awesome flavor and some extra kick. I highly recommend it! Simmer the stew for a bit, and add your tofu back in at the end. Taste-test the stew and adjust any seasonings before serving. Add some salt or soy sauce if needed (kimchi is pretty salty though, so go easy), extra gochujang, or, if your kimchi is relatively new and not too sour, some rice vinegar. Not all kimchi is vegan, so make sure to check the ingredients if using store-bought. I’ve used Mother In Law’s brand in the past and it worked well. You’ll find lots of variation in flavor among different batches and brands of kimchi. Some are spicier than others, some are more sour, some include different veggies. So be sure to adjust the seasonings in your stew to accommodate for this. Add a splash of rice vinegar, a dash of soy sauce, or a few extra spoonfuls of gochujang if needed. In a hurry? 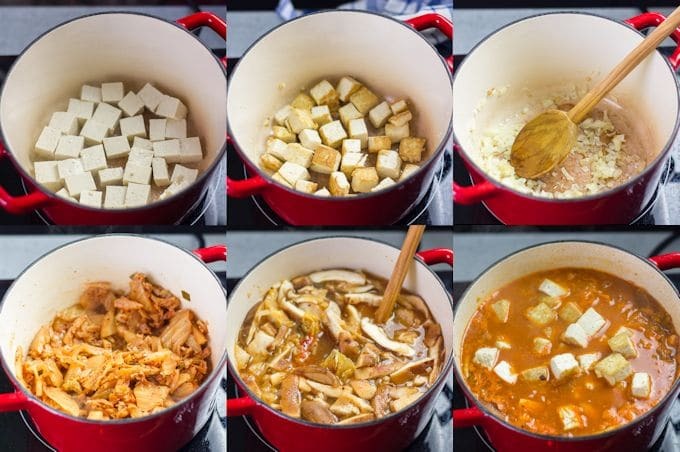 Cook your tofu in a separate pot or skillet while the stew simmers. I was more interested in saving dishes when I made this batch, so I cooked it in the same pot as the stew. Want to keep this recipe gluten-free? 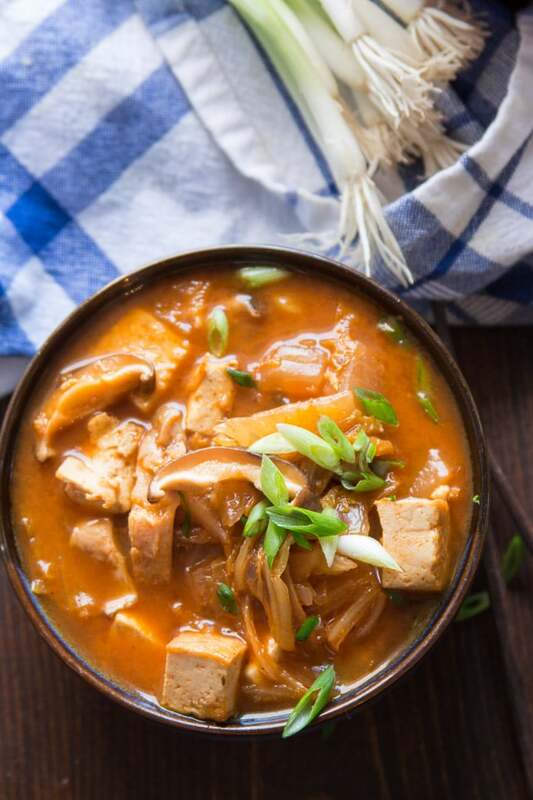 Use gluten-free tamari instead of soy sauce and make sure your kimchi is gluten-free. (As far as I know, most are, but once I came across a recipe for kimchi that called for wheat flour.) Also either omit the gochujang or seek out a gluten-free brand (it looks like they exist, but may be tough to find). You can also try substituting a mix of sriracha and miso. 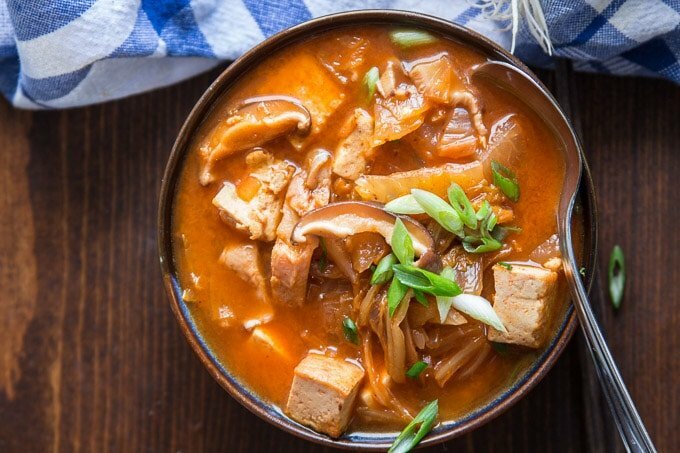 Need more guidance on how to make the perfect batch of vegan kimchi stew? Check out my video! 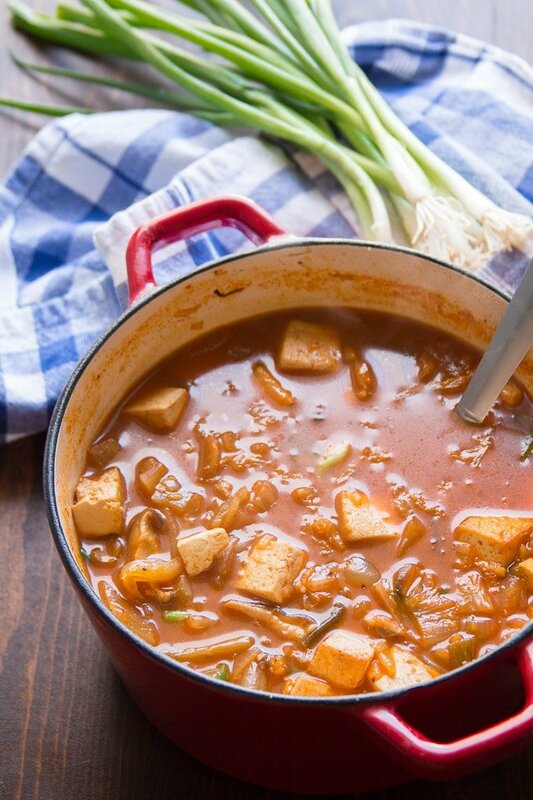 Warm up, with this spicy kimchi stew that's made with with tender shiitake mushrooms and crispy pan-fried tofu! Easy, vegan, and packed with spicy flavor, this cozy stew is hearty enough to make a meal of and perfect on cold winter days. Coat the bottom of a large nonstick pot with 1 tablespoon of oil and place it over medium heat. When the oil is hot, add the tofu in an even layer. Cook for about 10 minutes, flipping once or twice to achieve browning on multiple sides. Add the remaining tablespoon of oil to the pot and give it a minute to heat up. When the oil is hot, add the onion and cook for about 5 minutes, stirring occasionally, until soft and translucent. Add the garlic and cook for about 1 minute more, until very fragrant. Add the kimchi to the pot and and cook for about 2 minutes, stirring occasionally. Stir in the broth and shittake mushrooms. Raise the heat and bring the liquid to a boil. Lower the heat and allow the soup to simmer for about 10 minutes, until the mushrooms are tender. Stir in the tofu and gochujang if using. 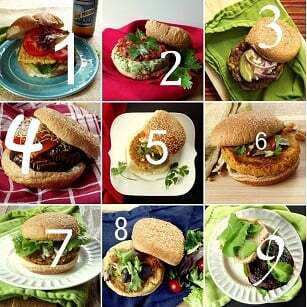 Taste-test, season with soy sauce if needed, and adjust any other seasonings to your liking. Ladle into bowls and top with scallions. Serve. oooh nice. I’m battling a cold right now and I bet kimchi stew would really help clear me out. I suppose it’s that time of year – I had a nasty cold when I made this and it was exactly what I needed. Feel better soon!! I love kimchi and am always looking for new ways to consume it, so thanks for sharing this recipe. Can’t wait to try it! Me too! Especially since I started making it myself – I now have a constant kimchi supply and I’m hooked. I’ll probably have a few more posts on fun ways to eat kimchi in the coming weeks… Hope you enjoy this one! I had never thought of it either and was surprised the first time I saw this dish on a restaurant menu, but I tried it and it loved it…these days I put kimchi in everything. Thank you and enjoy!! Yum! Thank you for such a delicious recipe. Yours looks more spicy than mine but still uber great. I shared my version today. Thanks! You’re welcome…and thank you for the link! I just scoped out your version and it sounds awesome. I thought about adding some fresh cabbage like you did to get the stew nice and hearty. I think I’ll try that next time. I’m glad you enjoyed it! Thanks Michelle!! I would love to try to make your kimchi recipe! Can you please share that? Sounds amazing! I love Kimchi! There is a restaurant in Toronto that serves a brown rice porridge with spicy homemade kimchi as a breakfast item. It is so delicious. I will send you the details and maybe you could recreate it? Also maybe you could post a homemade kimchi recipe for us? Thanks so much, love your recipes! Thanks Adrienne! 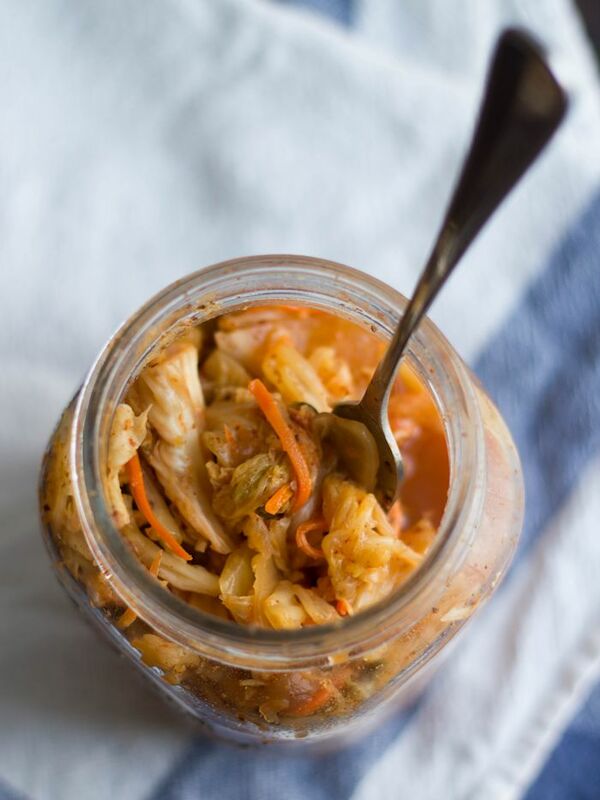 I have an old kimchi recipe that I’ll work on updating – it needs a few improvements! Here is the ingredients for the delicious Congee I was telling you about with their house made spicy kimchi. I always try to go there for breakfast if I am traveling to Toronto. It’s so good. Maybe you can create something similar? This is perfect for the current weather. Will be giving it a shot. Thank you for sharing. 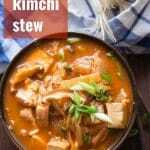 Does Kimchi (or any probiotic for that matter) lose it’s probiotic profile if it is heated? I love your dang blog (especially the logo! RAWR! :P) and this recipe. I love Korean food but it can be hard to veganize it sometimes. Kimchi jjigae is a favorite :3. I will say though that if gochujang is added that makes this dish not gluten free, unfortunately. Almost all store bought pastes have wheat in it. It’s hard to find one that’s traditionally made with just soy and chili pepper. Granted it’s a small amount of wheat but it could trigger those with celiacs. Oh, thanks for the head’s up! I just updated the post notes. And I’m so glad you’re enjoying the blog and recipes. Thanks so much Claudia!